The AFL Oil Stop Valve is fabricated from non-corrosive PVC or stainless steel. Standard sizes are 4”, 6” 8”, 10” and 12” discharge piping. Larger piping systems can be accommodated by manifolding units together. Optional screening can be provided if necessary to prevent the discharge of large floating solids. 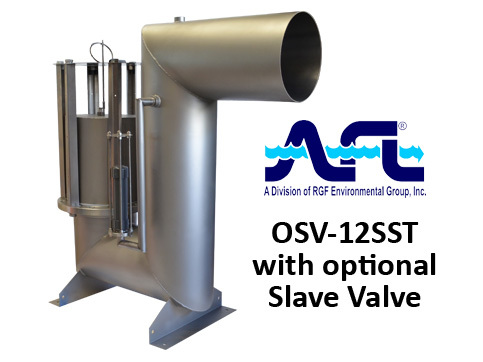 An optional slave valve is recommended if evaporation or leaky manholes allow the main float to close. Once rainwater enters the manhole, the slave valve will open and equalize the pressure allowing the main float to reopen. 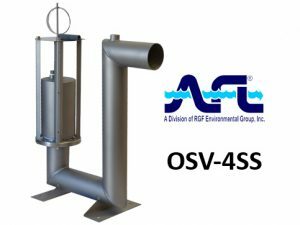 The OSV is designed for easy installation to any existing separators, catch basins or manholes. 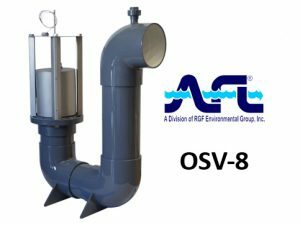 AFL also provides the OSV prepackaged in a fiberglass or metal catch basin or as an option on AFL’s oil water separators. Consider the OSV for those applications where oil spills are possible, but unpredictable such as electrical transformers, oil storage areas, and transportation fueling systems. The Oil Stop Valve is the most cost effective method to prevent a major disaster. 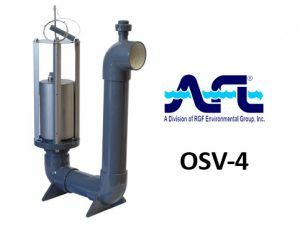 The OSV has only one mechanical moving part, a ballasted float set at a specific gravity between that of oil and water (.95 or less). When an oil spill occurs, the float loses buoyancy as the oil level increases until it finally seats itself on the discharge port. Thus the oil spill is confined. PVC models are the most economical way to prevent bulk hydrocarbon spills. Corrosion resistant PVC construction is an ideal choice for warm climates. Used in lieu of PVC units in colder climates, which may eliminate the necessity for an electric freeze protection package. The best option if fire is possible. By extending the pipe thru the sump wall, there is no connection inside the sump to burn and fail. Automate the transfer of product from the built-in reservoir of an oil/water separator to either an integral or separate storage facility. Systems are custom designed per application and consist of at least one pump with motor, a level switch and control panel. A sludge pump-out system consists of a diaphragm pump, an enclosed control panel, wiring, and plumbing to the point of sludge origination. The pump used in these sludge-handling systems is a self-priming diaphragm type. It pumps almost anything that passes through the suction line: sludge, mud, sand, and machining chips.